Eastern Part of St. George's Sound Florida. A very attractive example of the rare 1859 U.S. Coast Survey map or nautical chart of St. George Sound, Florida. St. George Sound is the coast part of Tate's Hell State Forest, just southwest of Tallahassee, along the Florida Panhandle. 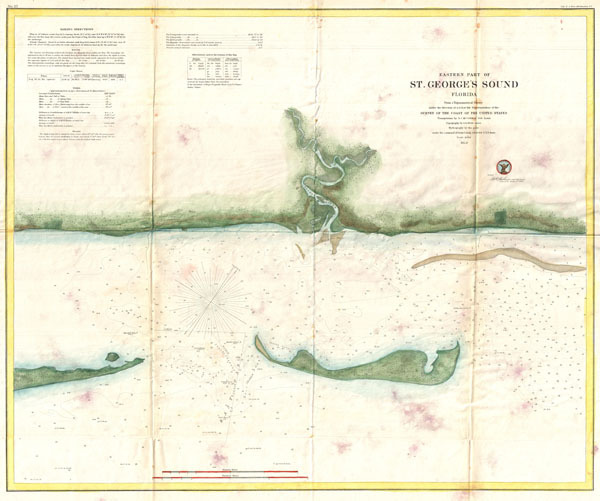 Centered on the Crooked River, this map covers the lands on either side of the river, the eastern part of the St. George Sound, and Dog Island. Features countess depth sounding and notes on shoals and channels. Sailing directions appear in the upper left quadrant. The triangulation for this map was completed by S. M. McCorkle. The topography is the work of G. D. Wise. The Hydrography was accomplished by a party under the command of J. K. Duer. The whole was completed under the direction of A. D. Bache, one of the most influential and prolific Superintendents of the U.S. Coast Survey. Published in the 1859 edition of the Superintendent's Report to congress. Good. Minor toning and wear and verso reinforcement on original fold lines. Printed on thin fragile paper. Some unusual discoloraiton in the lower quadrants.